Hey you. Yes, you. Let’s chat! I want to tell you about something amazing. My name is Erin Murphy and I am a senior here at Hope College studying Communication and Business. I currently serve as the Marketing Director for Dance Marathon. I’ve been a part of Dance Marathon since my freshman year and have loved every moment of it. 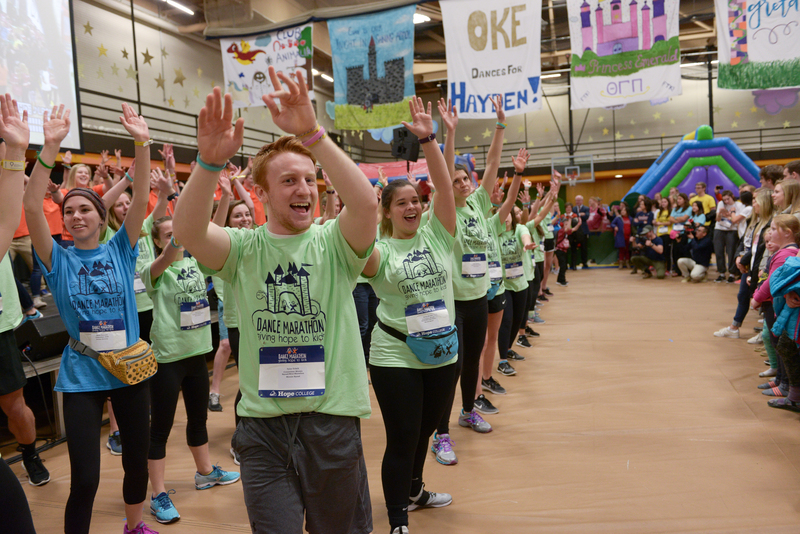 For those of you who may not be incredibly familiar with the program, Dance Marathon is a nationwide network of college students who partner with and fundraise for their local Children’s Miracle Network Hospitals. Throughout the year, students across the country plan events, partner with restaurants for percentage nights, and personally fundraise to add to their yearlong fundraising total that is shared at the main event: The Marathon itself. 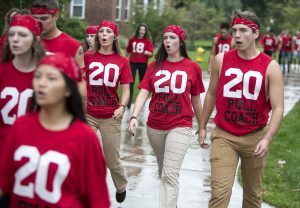 Hope’s Dance Marathon culminates in a 24-hour party where students across campus stay awake and on their feet in solidarity with kids who are fighting a variety of horrible illnesses. As a campus, we come together as one generation fighting for the next. For us here at Hope, our total proceeds go to Helen Devos Children’s Hospital in Grand Rapids. As we enter our 19th year of the program, we have already raised over $2 million for the hospital. We’ve gotten to create some amazing events, meet some beautiful Miracle Kids who have overcome so much, and create an incredible community of Hope students who are passionate about serving the hospital. Now, are you ready to hear that amazing thing I promised to tell you? 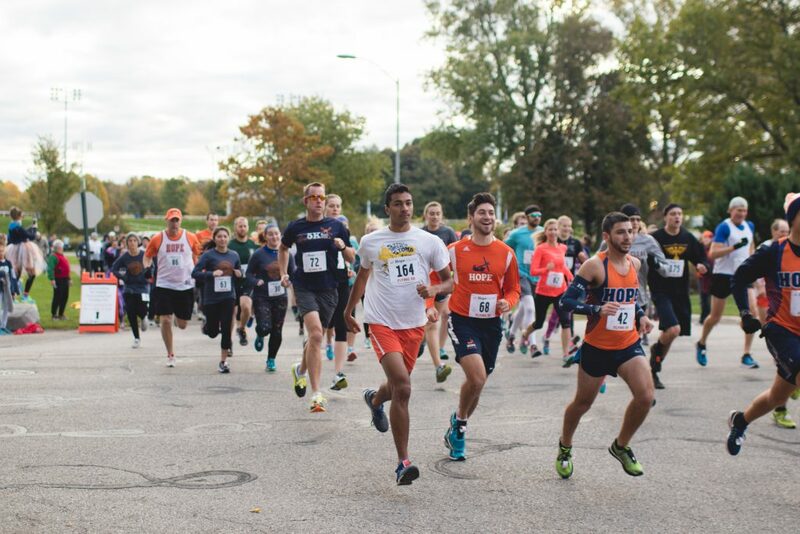 On Saturday, October 14, Hope College Dance Marathon is partnering with the office of Alumni and Family Engagement for the first ever Homecoming Donut Run 5K Benefiting Dance Marathon!!! Hope students and alumni are likely familiar with a local donut shop located within walking distance from campus. Late night “donut runs” have become a common part of the Hope experience. Essentially, the shop owner allows Hope students to walk in and buy freshly made donuts at all hours of the night. Seriously, sometimes the place is packed at 1 a.m. with donut-munching students. This unique tradition inspired us. So this year, we’re putting a fresh spin on it – making it a real life donut run! What does this mean? The 5K will still have the awesome long sleeve t-shirt, chip timing, and take you through our beautiful city of Holland. However, it will also feature delicious donuts holes along the route and full donuts at the finish line. We’ll also have some Miracle Kiddos at the starting line, ready to cheer you on and countdown the race! Woohoo, how exciting! 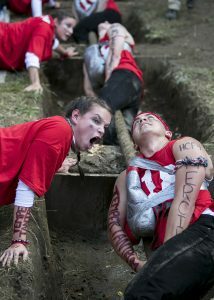 Additionally, all proceeds from this year’s 5K will go towards our year-long fundraising total. This year, we’re setting our goal high at $310,000. I know, it’s a big number, but the joy and wellness of the kids is definitely worth the challenge. You have the opportunity to go on a Donut Run for the kids. You can be a part of this incredible event and support children in the hospital. You can make a difference in the lives of kids who deserve the world. By going for a run through the beautiful city of Holland, you not only get a t-shirt and some delicious donuts, you get to proudly know that you are supporting child life services at HDVCH. Now that’s pretty amazing. Registration is now live and you can sign up here. The event will start and end at Ray and Sue Smith Stadium on Hope’s campus and the race begins at 9 a.m. The price is $20 for Hope students and Miracle Families and $30 for alumni, faculty, staff, and Holland community members. We are so excited about this partnership with the Alumni and Family Engagement office and can’t wait for Homecoming weekend to be here! We would love to see you there, supporting kiddos who deserve the world. So bring your friends, family, professors, students, anyone- and we’ll see you on Saturday, October 14!